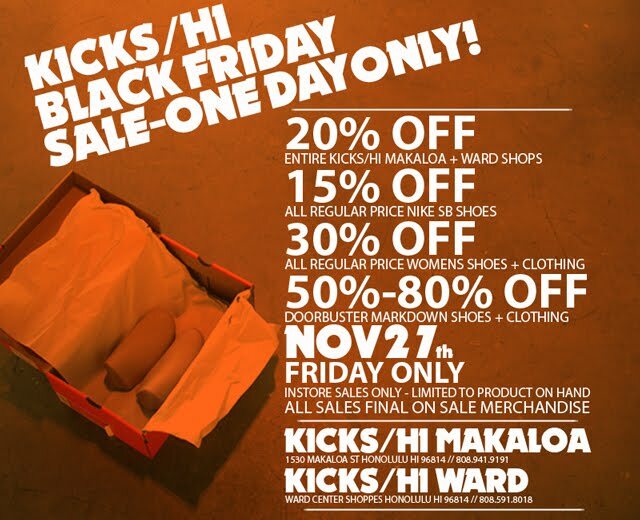 All the Long Beach heads are heading to Proper for their Black Friday sale, well, where's all the Hawaii fam heading? Yep, that's right, the spots that I ultimately have to get to every time I'm at my home away from home, Kicks HI and In4mation. Just as I vouch for the owners of Proper, cats like DJ Delve at Kicks HI and Todd Shimabuku at In4mation have been down with Up Above Records, the Visionaries, and all of our affiliates for nearly a decade, and not only am I a fan of their stores and product, but I have a respect for how they carry themselves in what could be a rather pretentious world of fake fashionistas and jockers. KICKS HI: Now the homies at Kicks HI have been doing it right for years now, I'm sure you've heard of the famous "Aloha Dunk" that helped the world recognize this top-tier sneaker shop in Hawaii. Whether they're coming from the New York, Los Angeles or Tokyo, heads have to visit one of Kicks HI two locations when they visit Honolulu. With an extraordinary selection of shoes you probably can't find in most sneaker shops around the world, along with unique Kicks HI gear that captures the HI state of mind, you'll definitely load up when you stop by their Makaloa or Ward Center locations. 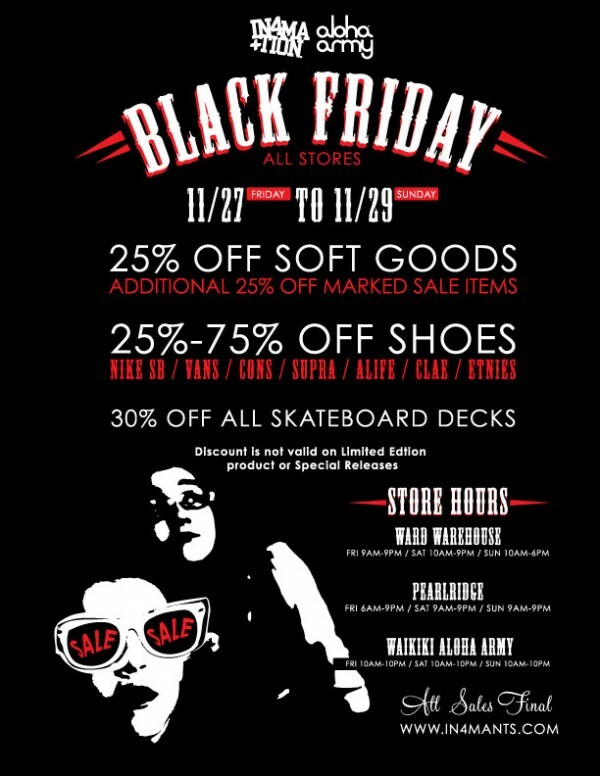 You won't want to miss the Black Friday One Day Sale, checkout the flyer for details. With a lot of people trying to "come up" in the trendy urban boutique market, the fellas at In4mation are serious heads: seriously humble and seriously passionate about representing the movement correctly with respect and knowledge of the circles they are down with. 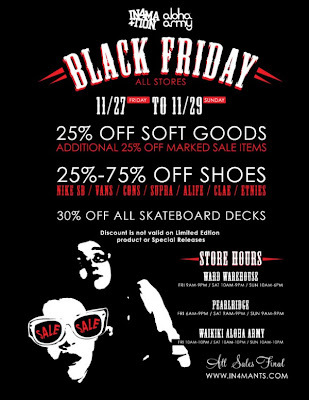 The fam at In4mation are lacing up customers on Black Friday as well. You're probably well aware of the collaborations they've done with Vans, Diamond, Gravis, etc., and their clothing line is a favorite amongst my homies with a discriminating design sense. I've heard that their latest In4mation x Vans Half Cab has just arrived, and should be released sooner than soon, so don't sleep on becoming an In4mation insider so you don't miss the release. In4mation has locations at the Ward Warehouse, their Aloha Army shop at Waikiki Beachwalk, and the brand new store in Pearlridge. Check out their Black Friday Sale this Give Thanks weekend. Happy Shopping people, spend all of your money at the right places! This is a superb post it right for years now, I'm sure you've heard of the famous "Aloha Dunk". I benefit from the knowledge lot. I will bookmark this page. show gratitude’s for sharing this information.